Police are attempting to locate a missing Alzheimer's patient. Frank "Chick" Zangarlo Jr walked away from his residence in the area of East Elm & Scott Ave between 6pm and 8pm. 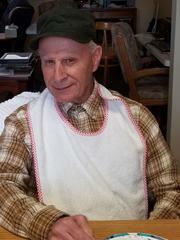 Mr Zangarlo is 80 years old, white male, 5'6", 130 lbs, with brown eyes, gray hair, and was wearing a black baseball cap. Please call Lindenwold Police at (856) 783-4900 with any information.